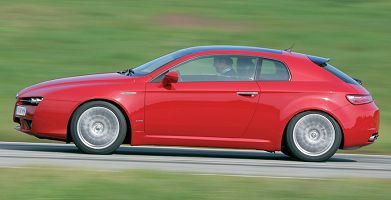 The stunning Alfa Romeo Brera made its debut at the 2005 Geneva Motor Show, three years after the first public appearance of the original Giorgetto-Giugiaro designed concept car at the same show in 2002 (images). That car went on to gain international acclaim, and the production version maintained almost exactly the same outstanding looks. 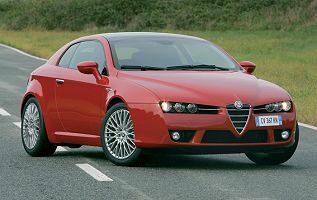 Based on the premium platform and mechanicals of the Alfa 159, the new Brera has those characteristics most associated with Alfa Romeo - sportiness and elegance - in a unique and exclusive style. The harmony of the Brera's shape and size, allied to the outstanding engineering and driveability of an Alfa Romeo, makes for a car which is both beautiful and functional. The Brera is a 2+2 of generous dimensions: 1830mm wide, 4414mm in length and 1372mm high. However the design, featuring deeply tapered front and rear styling, creates the impression of a very compact car, looking much smaller in the metal than in images. The interior is both cosy and sophisticated, through the careful selection of high quality materials and the introduction of some novel ideas such as the wide glass fixed roof that creates more natural interior light for passengers, adding to the sensation of spaciousness inside. Practicality has not been forgotten, and the boot is a usable size, considerably larger than the Alfa GTV which it replaces. Available in two trim levels, the Brera is powered by three different engines, a 200bhp 2.4 JTD turbo-diesel and two petrol engines (the 185 bhp 2.2 JTS or the 260 bhp 3.2). The two lower powered engines are fitted with front-wheel drive, whilst the V6 comes with a four-wheel-drive system similar to the Q4 recently introduced to the Alfa 156 Crosswagon. Transmissions are either an automatic box or a 6-speed manual depending on the version. As well as the character and delights one expects from an Alfa Romeo, the new car delivers outstanding dynamic performance thanks to the use of quadrilateral front suspension and Multilink rear suspension. As would be expected in such a vehicle, the Brera is equipped with the most sophisticated electronic systems to monitor and control key dynamic parameters of braking and roadholding to deliver greater driving safety. Unusually for a modern car, the entire electronic stability systems (traction control and ESP/VDC) can be disactivated by the driver. An open version, known simply as the Alfa Romeo Spider, with a folding canvas roof, was first shown to the public early in 2006. Apart from the roof and the deletion of the (rather pointless) back seats, the Spider was mechanically identical to the coupe in most respects. The diesel engine was not available at launch in the Spider, but was soon introduced. In 2007 the 2.4 MultiJet diesel engine saw its power grow from 200bhp to 210bhp, except with the Q-Tronic automatic transmission, which remained 200bhp. 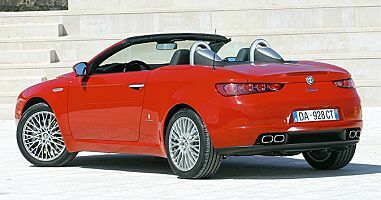 More changes to the Alfa Brera and Spider came in 2008, when a series of minor tweaks were made to the product and range. A new system called 'Electronic Q2' was introduced, which provides a similar functionality to a LSD by using differential braking. 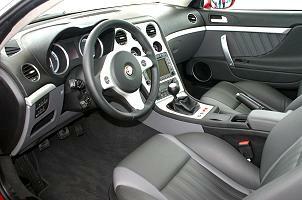 A series of changes to the interior included new fabrics, styles, dashboard, instruments, materials etc. The 3.2 V6 became available with front-wheel-drive (previously only available with 4WD). More significantly was a weight reduction programme which saw the cars lose several kilos from the kerb weight. See the original Giugiaro Brera concept car. See a video of the New Spider here (3.5MB). There is also a list of all our picture galleries (including museums, motorshows and various events). Wallpapers/Desktop Backgrounds of numerous Alfa Romeo's also available to download. 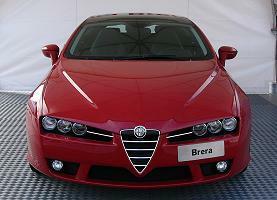 Please send your comments on the Brera, these will be added to this page for future visitors to read. Please include your name (or a nickname) and your country. Thanks. Beautiful. I look forward to owning one.